9mm sterling silver or hypoallergenic surgical steel lightning bolt design on a 316L surgical steel 6mm or 8mm bar with 3mm screw-on ball closure secured at the back of the ear. I bought this along with a couple of other items to complete a look for a night out. Good quality and stands out. Really happy with my purchase. Great, earrings exactly as described, prompt delivery. Daughter is a big Harry Potter fan and was thrilled with them, thank you. 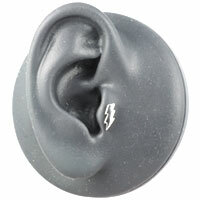 Great product, wouldn't know it was in your ear. Doesn't get in the way when sleeping and doesn't catch on anything. I even ordered 2 of them. Great product. Amazing quality. The only downside is, if worn daily, the silver starts to fade after a while but I mean a LONG while. It sounds like the lightning bolt on your earring has become tarnished. This is normal for silver jewellery and you should be able to clean it off and restore the original shine. 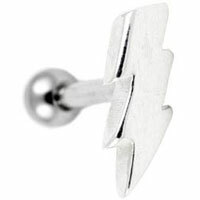 Not sure it really looks like a lightning bolt, but attractive nevertheless. Perfect present for my sister- she loved it! !